Friends. They’re nice to have. If you agree with the previous statement, great. Proceed with life. If not, well, consider giving them one of the five gems on our 2014 rejection list below. Thank you, Laser Lapel. 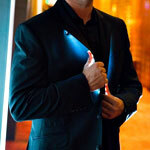 A sincere, from-the-bottom-of-our-hearts thank you for unleashing your LED-illuminated jacket accents for nightlife “bros” upon our populace. Because now, there’s no question who everyone should be avoiding at the bar. What you’re looking at here is a couch. That looks like a bird’s nest. 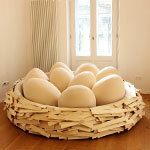 And yes, those are really egg-shaped pillows. The manufacturers say that it’s an inspiring space for “browsing the Web, reading, relaxing, loving—” which is where we’re going to stop them. Bike safety. It’s serious stuff. And not at all funny... unless you’re talking about protecting your, uh, glutes. Which is what these impact-resistant shorts claim to do using an “aggressive tailbone protection” technology. And those, friends, are some science dollars hard at work. —Proficient in walking around sans shirt. —Make drinks for awaiting female clientele. —Feed grapes to awaiting female clientele. Okay, this doesn’t sound so bad. Maybe you’re thinking about New Year’s resolutions. And maybe some fitness-oriented ones come to mind. 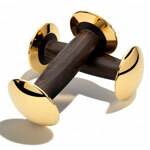 And maybe investing $150,000 in a pair of 18-karat gold dumbbells will inspire you to make them stick. And maybe... not.